3 Quadbikes Completed with a 2 wheel motorcycle in the background. This plan is simple & strong ready for fun and play. 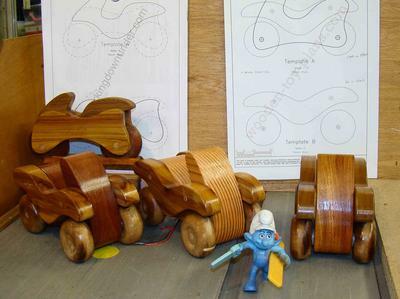 In my opinion theses are great wooden toys that Tony has designed as they are pretty well bullet proof BUT best of all the plans are free, THANK YOU Tony and congratulations on such a brilliantly designs wooden toy. 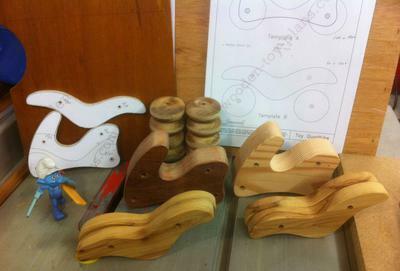 This first set of prototypes which I've done are; bodies made from Oregon, Red Gum, a mystery timber; sides from Cypress Pine, Spotted Gum and the wheels are from a piece of 60plus year old hardwood that came out of my re-roofing; 3-4 coats of Gloss Clear Polyurethane....It took about 4hours to do each of the three Quad Bikes making the template and cutting the wheels, but I suspect it'd be a little quicker next time.